If you subscribe by email, you’ll get an email each morning containing the post(s) from the previous day. I’ve started using SVG for graphs, equations, and a few other images. The main advantage to SVG is that the images look sharper. Also, you can display the same image file at any resolution; no need to have different versions of the image for display at different sizes. And sometimes SVG files are smaller than their raster counterparts. There may be a way to have web site visitors see SVG and email subscribers see PNG. If not, email subscribers can click on the link at the top of each post to open it in a browser and see all the images. By the way, RSS readers handle SVG just fine. At least Digger Reader, the RSS reader I use, works well with SVG. The only problem I see is that centered content is always moved to the left. 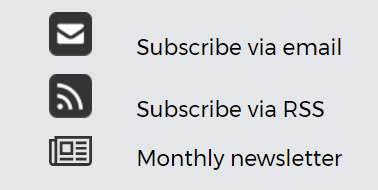 The email newsletter is different from the email blog subscription. I only send out a newsletter once a month. It highlights the most popular posts and says a little about what I’ve been up to. I just sent out a newsletter this morning, so it’ll be another month before the next one comes out.